The focal of this hand beaded necklace is a polymer clay mask pendant that looks like something one would wear for Beltane. There are matching poly clay beads in the 24? strand, along with some handmade glass beads and some thread-decorated beads from Thailand. 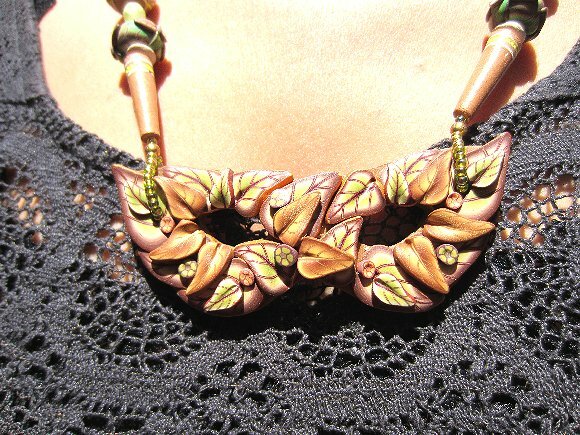 The tribal mask pendant and beads are all in lovely shades of terracotta and green; perfect for camouflaging oneself in a woodland setting. The hand beaded necklace closes with a gold filigree box clasp. 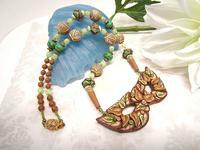 This truly one of a kind tribal mask necklace is from SPARKLE PLENTY, of course.